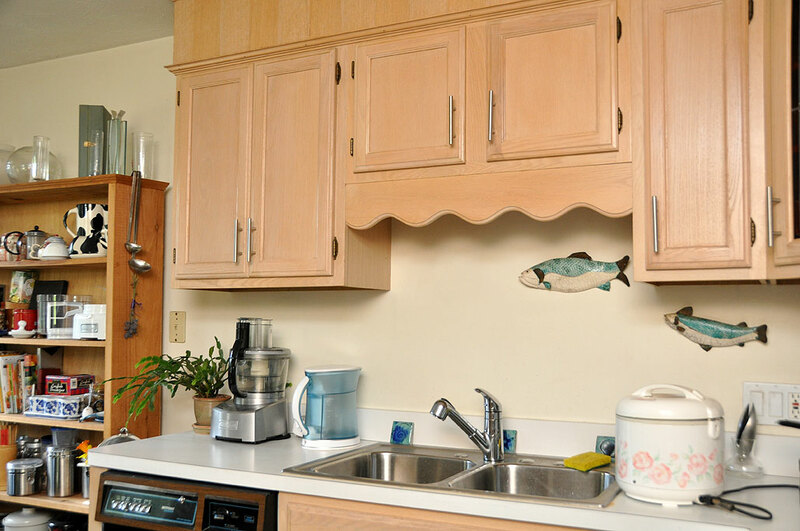 The handles on the doors and drawers in the RainyDayKitchen have always been a bit too “antique-ish” for our taste. As handles never wear out there was never a good excuse to get rid of them, other than just aesthetics. Stainless steel handles are typically around $6.50 online and can cost up to $13 in stores. Even though it would only cost a few hundred dollars to change them out, it just seemed frivolous to spend money on handles when there are other more important things we could use it for. However, when the interns (who seem to spend more time surfing Craigslist than actually doing their job…or IS that their job?) found an ad from someone selling thirty stainless steel handles for $40, our interest got piqued. The ad had just posted that day, but a deal this good would not last for long. We did a quick count of how many we needed …thirty-two, including the pulls in the two bathrooms. Hmmm…could work. The only thing we needed to check was whether the center-to-center distance (3″) of their screw holes was the same as our current handles. We fired off an email and asked. As luck would have it, they were the size we needed. We indicated our interest, agreed on a time for pickup, drove down to Hanover, and closed the deal before anyone had time to horn in on our action. We could not have been more pleased with the purchase. 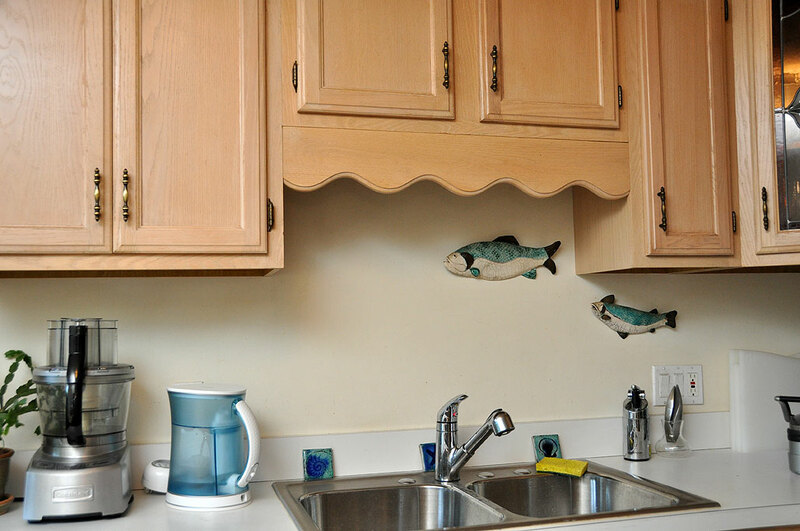 These handles were from a recent kitchen upgrade because the owner wanted a more “antique-look” to their hardware! The handles looked brand new. What’s more, the stainless steel screws were included as part of the package. We reused the old screws for the drawers because they were longer, but used the matching stainless steel screws for all the doors. With the handles removed from all of the cabinets and drawers, it was a good opportunity to wipe down all of the surfaces. The surfaces had not been cleaned in a while (ever), but an all natural kitchen-cabinet cleaner (Parker&Bailey, from Maine) made short work of the task. We started the project with a regular screwdriver, but after one handle change, we realized it was a task better suited for power tools. We were able to complete this DIY project in a Saturday morning (after a few cups of coffee, of course) even WITH the help of the interns. The one RainyDayTip we can offer after doing the project is to start with a fully charged electric screwdriver. We didn’t and ran out of juice toward the end of the handle removal. However, we took advantage of the time-out for cabinet wipe-down to recharge the screwdriver for the new handle install. God forbid if we had to go old-school and do things manually!